Last month I had the opportunity to make another annual trip to my lovely Firenze in Northern Italy. I guess it’s becoming somewhat of a trend of my mother and mine. Constantly banging into one another as we no more have our eyes set on the cobbled streets in front of us, but rather gazing longingly at the window displays down Via de’ Tornabuoni. Needless to say, Dolce and Gabanna’s Autumn Winter ’15 collection was the point of no return: A majolin poplin at me as I gazed longingly at it. 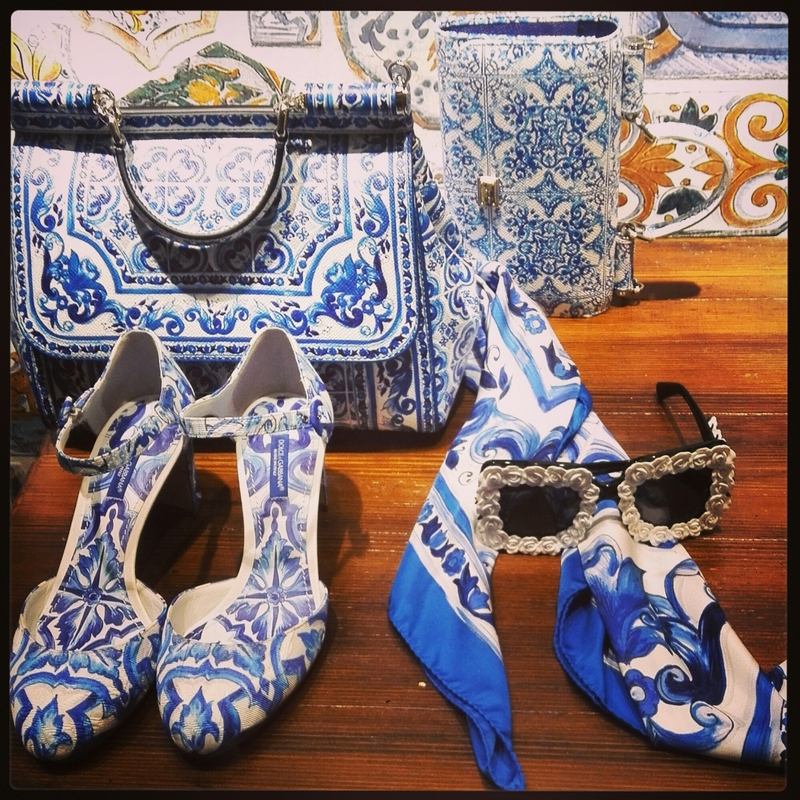 The AW Collection is made up of decorated tonal blue and whit motifs inspired by Majolica. This traditional Italian pottery design is as old as the hills. It is believed it dates as far back as the Renaissance era. I was left only to dream at what I would look like in them as it had well passed trading hours- A blessing in disguise (finance-wise). 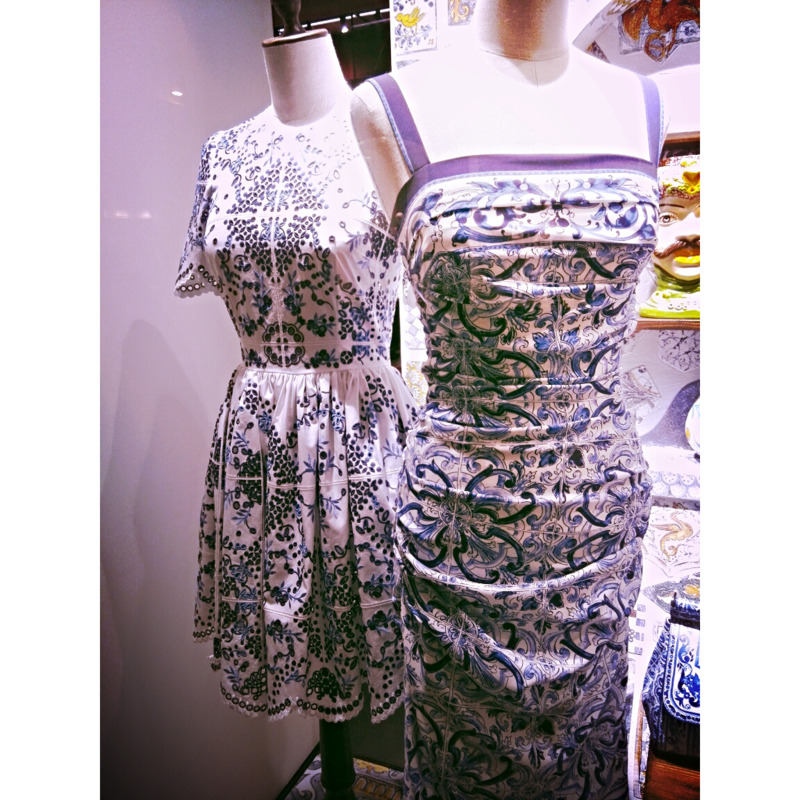 Dolce and Gabanna have taken this ideology and transported us back in time through these delightful fabrics. Rich, yet simplistic. The playful sundresses continued to tease passer bys and tourists alike. To compliment the clothing, the next window was dressed with majolin accessories to boot. Kitten heels, neck scarves and sunglasses only added to the long, imaginary wish list of mine. Above: Blue majolin print calfskin Sicily bag (medium)€1,400. Blue majolica embroidered brocade valley court shoe €745. Printed silk twill foulard. Highly intricate motifs in blues, whites, luscious silk and eye catching accessories will all appease. Next season’s D&G is something to certainly look forward to, with or without ownership of any of the above. Nothing wrong with simple appreciation!